The Terrestrial System Modeling Platform (TSMP) is a scale-consistent, highly modular, massively parallel, fully integrated soil-vegetation-atmosphere modeling system. TSMP implements a physically-based representation of transport processes of water, energy and momentum across scales down to sub-km resolution including explicit feedbacks between groundwater, the land surface and atmosphere with a focus on the terrestrial hydrological and energy cycles. 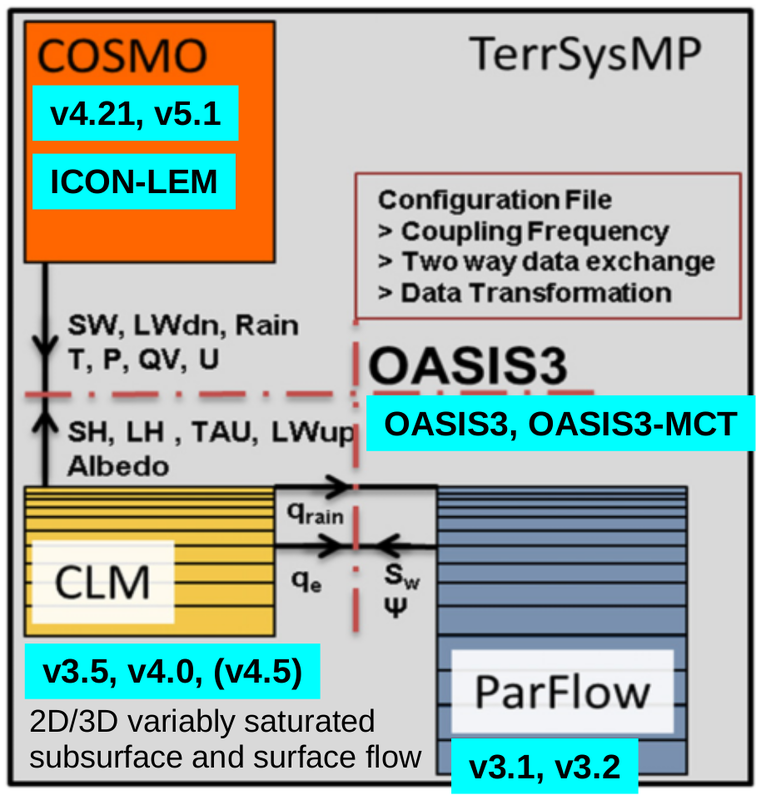 TSMP currently comprises three component models: The Consortium for Small-scale Modeling (COSMO) atmospheric model, the Comunity Land Model (CLM), and the hydrologic model ParFlow ParFlow coupled with OASIS3-MCT coupler and data assimilation capabilities through the Parallel Data Assimilation Framework (PDAF). TSMP is extensively used for idealized and real data process and sensitivity studies in water cycle research, for climate change simulations, data assimilation studies including reanalyses, as well as experimental real time forecasting and monitoring simulations, ranging from individual catchments to continental model domains. TSMP provides all features of the respective component models and tries to follow ongoing component model developments continuously. Initial presentation of the functionalities of the fully coupled TSMP The capabilities of the coupled in systems are presented through idealized studies on key hydrologic processes (runoff production at different hydrological modeling scales, water table changes through groundwater pumping) and their interplay with processes in the atmospheric boundary layer. 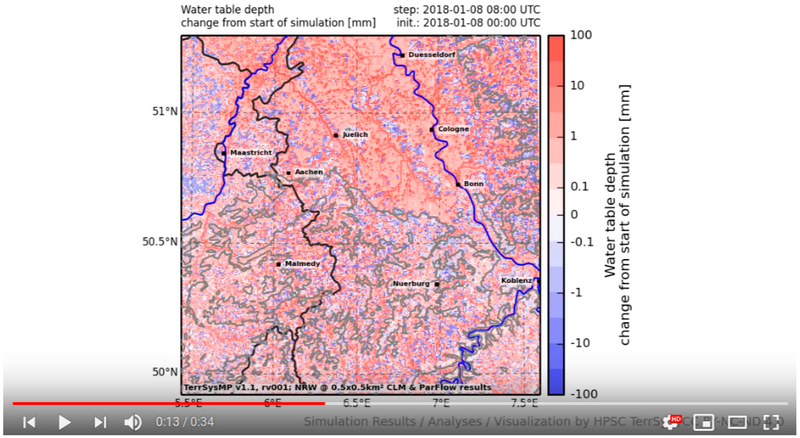 First real data experiments over the Rur river catchment are also presented. Groundwater-land surface-atmosphere feedbacks during the European 2003 heat wave This study applies TSMP for the first time over the 12km European EURO-CORDEX EUR-11 domain during the 2003 heat wave event in order to investigate the effects of various lower boundary conditions and physical groundwater representations (full 3D vs free drainage) on land-atmosphere coupling, i.e. soil moisture-temperature feedbacks specifically. Implementation of PDAF data assimilation into TSMP A synthetic case study for a land surface–subsurface system (0.8 million unknowns) is used to demonstrate the effects of data assimilation in the integrated model TSMP and to assess the scaling behaviour of the data assimilation system. 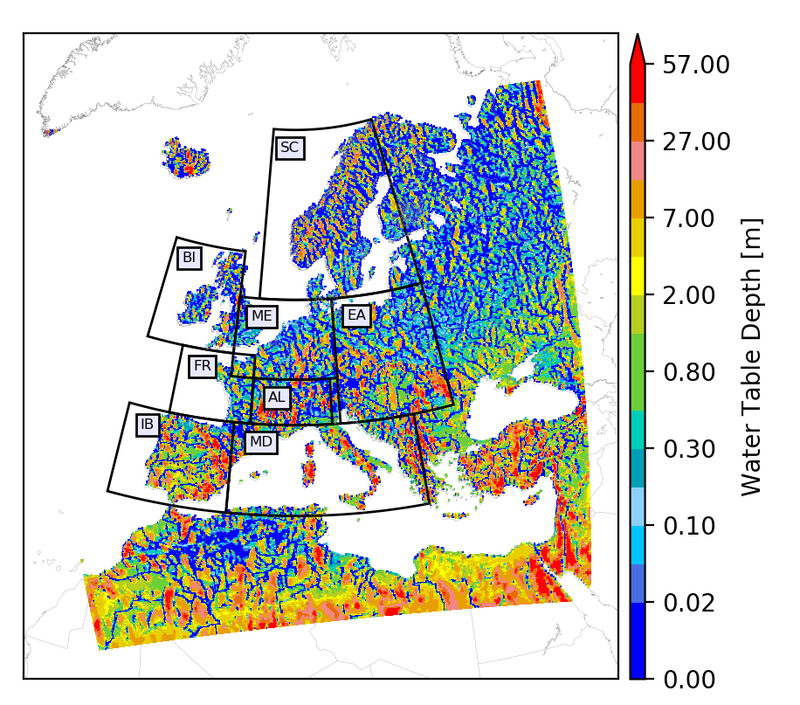 Pan-European groundwater-to-atmosphere climatology This study provides the first simulated long-term (23 years), high-resolution terrestrial groundwater-to-atmosphere climatology, comprising all variables from groundwater across the land surface into the atmosphere. The data set offers an unprecedented opportunity to test hypotheses related to short- and long-range range feedback processes in space and time between different compartments of the terrestrial system. The dataset is available for download through the Data Publication Server Forschungszentrum Juelich. TSMP has been driven by ERA-Interim reanalysis on the EURO-CORDEX EUR-11 grid from 1989 to 2018, adhering to the simulation protocol of the EURO-CORDEX evaluation runs. Extensive postprocessed model outputs are available through the datapub repository of the Juelich Supercomputing Centre: https://datapub.fz-juelich.de/slts/cordex/index.html. TSMP as a regional and continental monitoring and forecasting system In this study TSMP is implemented over a 1km convection permitting resolution model domain over North Rhine-Westphalia, Germany, and a second, European model domain at 12km. We document the complete monitoring and forecasting workflow. The experimental forecasting products provide complementary, additional variables, such as plant available soil water, groundwater table depth, and groundwater recharge and storage, which are usually not available. TSMP is an open-source, community integrated model that is freely available through one of our local git repositories (GitHub to come). Starting in 2010, it was developed within the Collaborative Research Centre (TR32) project, funded by the German Research Foundation (DFG). Ever since then, TSMP development has been driven by groups within the Centre for High-Performance Scientific Computing in Terrestrial Systems, as part of the Geoverbund ABC/J, the geoscientific network of the University of Cologne, Bonn University, RWTH Aachen University, and the Research Centre Jülich. The current team is anchored in Jülich and Bonn. TSMP is a coupled model, which connects independently developed component models via an external coupler. What we provide, due to licensing constraints and model system maintenance necessities, as the TSMP "model system" is essentially a complete built system, incl. all relevant scripts and software patches to retrieve the various component models, patch them to make them TSMP compatible and compile them into the TSMP model system including run control scripts and test setups. Only a limited number of model version combinations are supported, albeit featuring usually very recent if not the most recent component model versions. A complete table is to come soon. For example a very commonly used combination of component models in past studies with TSMP v1.1.0 has been COSMO v4.21, CLM v3.5, and ParFlow v3.1. Please note while we provide a scripting solution to retrieve the suitable versions of the respective component models, the users themselves have to take care of having the appropriate license. TSMP is available as open source code for free from our local git repository at Bonn University (https://git2.meteo.uni-bonn.de/projects/terrsysmp), including documentation, pre- and post-processing tools, as well as example test cases that feature different model uses to get started. The git repository is right now still private, please register on the webpage to get access. TSMP is released under the MIT license. Shrestha, P., Sulis, M., Masbou, M., Kollet, S., and Simmer, C. (2014). 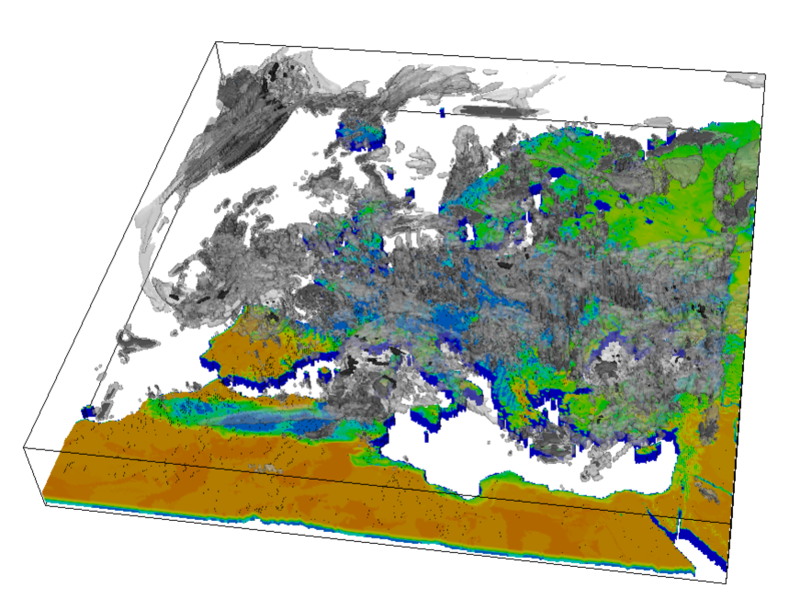 A Scale-Consistent Terrestrial Systems Modeling Platform Based on COSMO, CLM, and ParFlow. Monthly Weather Review, 142(9), 3466–3483. doi:10.1175/MWR-D-14-00029.1. Gasper, F., Goergen, K., Kollet, S., Shrestha, P., Sulis, M., Rihani, J., and Geimer, M. (2014). Implementation and scaling of the fully coupled Terrestrial Systems Modeling Platform (TerrSysMP) in a massively parallel supercomputing environment &ndash; a case study on JUQUEEN (IBM Blue Gene/Q). Geoscientific Model Development, 7(5), 2531-2543. doi:10.5194/gmd-7-2531-2014. To report bugs, request features, or ask a question in relation to model implementation or usage, please send an e-mail to tsmp@fz-juelich.de. Please note that TSMP is a community supported research code and while we will attempt to answer questions your patience is appreciated. The TSMP user guide, the technical description, and a getting started guide are available in the TSMP git repository. Course elements from the Fall School of the Centre for High-Performance Scienctific Computing in Terrestrial Systems on (i) a fully coupled idealized ensemble, (ii) a full EURO-CORDEX EUR-11 pan European model domain real data climate run, (iii) as well as CLM+ParFlow parallel data assimilation experiment exist, integrated into the git repository complementing the documentation with ready-to-run hands-on excercises. Keune, J., Sulis, M., Kollet, S., Siebert, S., and Wada, Y. (2018). Human Water Use Impacts on the Strength of the Continental Sink for Atmospheric Water. Geophysical Research Letters, 45(9), 4068-4076. doi:10.1029/2018GL077621. Kollet, S., Gasper, F., Brdar, S., Goergen, K., Hendricks-Franssen, H.-J., Keune, J., Kurtz, W., Küll, V., Pappenberger, F., Poll, S., Trömel, S., Shrestha, P., Simmer, C., and Sulis, M. (2018). Introduction of an Experimental Terrestrial Forecasting/Monitoring System at Regional to Continental Scales Based on the Terrestrial Systems Modeling Platform (v1.1.0). Water, 10(11), 1697. doi:10.3390/w10111697. Shrestha, P., Sulis, M., Simmer, C., and Kollet, S. (2018). 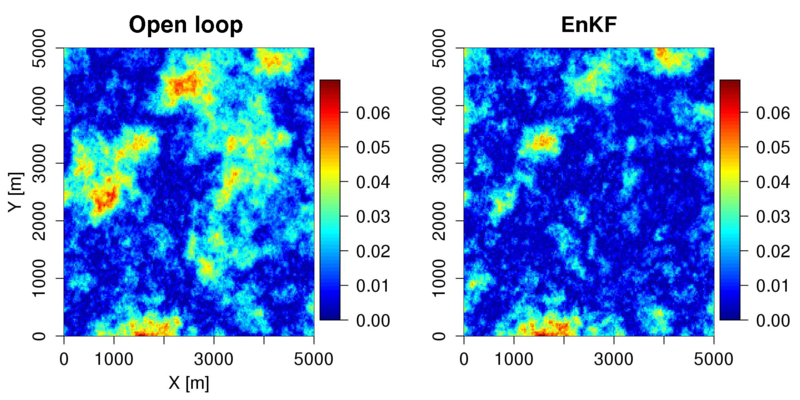 Effects of horizontal grid resolution on evapotranspiration partitioning using TerrSysMP. Journal of Hydrology, 557. doi:10.1016/j.jhydrol.2018.01.024. Gebler, S., Hendricks Franssen, H.-J., Kollet, S. J., Qu, W., and Vereecken, H. (2017). High resolution modelling of soil moisture patterns with TerrSysMP: A comparison with sensor network data. Journal of Hydrology, 547, 309-331. doi:10.1016/j.jhydrol.2017.01.048. Sulis, M., Williams, J. L., Shrestha, P., Diederich, M., Simmer, C., Kollet, S. J., and Maxwell, R. M. (2017). Coupling Groundwater, Vegetation, and Atmospheric Processes: A Comparison of Two Integrated Models. Journal of Hydrometeorology, 18(5), 1489-1511. doi:10.1175/JHM-D-16-0159.1. Keune, J., Gasper, F., Goergen, K., Hense, A., Shrestha, P., Sulis, M., and Kollet, S. (2016). Studying the influence of groundwater representations on land surface-atmosphere feedbacks during the European heat wave in 2003. Journal of Geophysical Research: Atmospheres, 121(22), 301-325. doi:10.1002/2016JD025426. Kurtz, W., He, G., Kollet, S., Maxwell, R., Vereecken, H., and Hendricks Franssen, H.-J. (2016). TerrSysMP-PDAF (version 1.0): a modular high-performance data assimilation framework for an integrated land surface-subsurface model. Geoscientific Model Development, 9(4), 1341-1360. doi:10.5194/gmd-9-1341-2016. Shrestha, P., Sulis, M., Simmer, C., and Kollet, S. (2015). Impacts of grid resolution on surface energy fluxes simulated with an integrated surface-groundwater flow model. 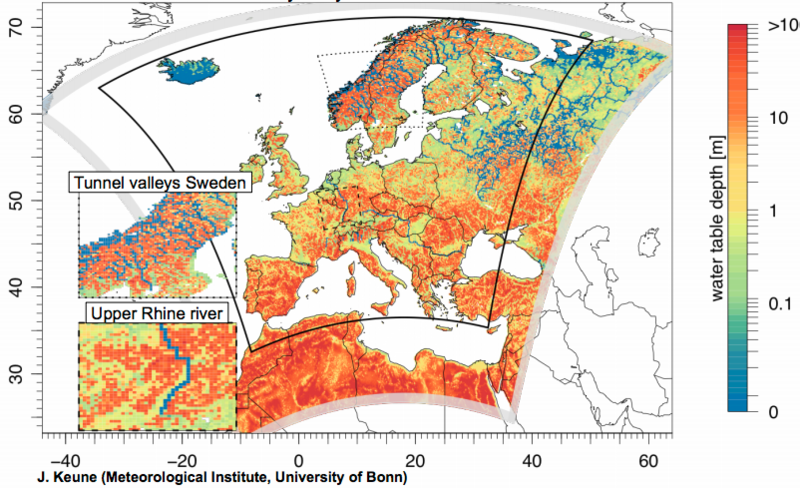 Hydrology and Earth System Sciences, 19(10), 4317-4326. doi:10.5194/hess-19-4317-2015. Gasper, F., Goergen, K., Kollet, S., Shrestha, P., Sulis, M., Rihani, J., and Geimer, M. (2014). Implementation and scaling of the fully coupled Terrestrial Systems Modeling Platform (TerrSysMP) in a massively parallel supercomputing environment - a case study on JUQUEEN (IBM Blue Gene/Q). Geoscientific Model Development, 7(5), 2531-2543. doi:10.5194/gmd-7-2531-2014. Shrestha, P., Sulis, M., Masbou, M., Kollet, S., and Simmer, C. (2014). A Scale-Consistent Terrestrial Systems Modeling Platform Based on COSMO, CLM, and ParFlow. Monthly Weather Review, 142(9), 3466-3483. doi:10.1175/MWR-D-14-00029.1. The TSMP website is a joint effort of the institutions mentioned in the Team section. The TSMP website is hosted and maintained at the Forschungszentrum Jülich GmbH through the Institute of Bio- and Geosciences (IBG-3, Agrosphere) as part of the Competence Centre for High-Performance Scientific Computing in Terrestrial Systems (HPSC TerrSys), an initiative of Geoverbund ABC/J, which is a cooperation between RWTH Aachen University (Rheinisch-Westfälische Technische Hochschule Aachen), University Bonn (Rheinische Friedrich-Wilhelms-Universität Bonn), University of Cologne, and Forschungszentrum Jülich GmbH. The Competence Centre HPSC TerrSys is located at Forschungszentrum Jülich. We take the protection of your personal data very seriously and process the data collected when you visit this website in accordance with the latest provisions of data protection law. We neither publish your data nor pass it on to unentitled third parties. In the following declaration we set out what data we collect during your visit to our websites, exactly how it is used and whom you can contact if you have any further questions. date and time of server request. guarantee system security and stability. The data processing described above is based on Article 6 (1), sentence 1f of the EU General Data Protection Regulation (GDPR). Our legitimate interest arises from the above purposes for data collection. For the statistical evaluation of our website, we use Google Analytics, see below the disclaimer on Google Analytics. As a rule, the use of our website is possible without providing any personal information (e.g. name, address or e-mail address). Where this is collected, it is done exclusively on a voluntary basis and with your consent under Article 6 (1), sentence 1a GDPR. This data will not be transferred to third parties without your express permission and then only for the purposes for which you have notified us. Data is only transferred to authorised state institutions and authorities within the framework of legal information requirements or if we are obliged to do so by a court order. The data is deleted as soon as it is no longer needed for processing and where there is no legal requirement to store it. Some Internet websites use so-called cookies. These are small text files which are downloaded onto your computer and stored by your browser. They cause no damage to your computer and contain no viruses. They are designed to make our services more user-friendly, efficient and secure. Most of the cookies we use are so-called "session cookies" which are deleted automatically once you leave our website. Other cookies remain stored on your computer until you delete them. They enable us to recognise your browser on your next visit. This website uses Google Analytics, a web analytics service provided by Google, Inc. ("Google"). Google Analytics uses "cookies", which are text files placed on your computer or device to help the website operator analyse how visitors use the site. The information generated by these cookies about your use of this website is usually transmitted to and stored by Google on servers in the USA. On behalf of the operator of this website, Google will use this information for the purpose of evaluating your use of this website, compiling reports on website activity for website operators and providing other services relating to website activity and internet usage. We use Google Analytics with an activated IP anonymization feature. This means that Google shortens the IP address of users within Member States of the European Union or other signatories to the agreement on the European Economic Area. Only in exceptional cases will the full IP address be transferred to a Google server in the USA and shortened there. Google will not associate your IP address with any other data held by Google. Google may also transfer this information to third parties where required to do so by law, or where such third parties process the information on Google's behalf. You can prevent the gathering of information by Google Analytics about your visit to this website by clicking on the following link. It will download an opt-out cookie which will prevent the future collection of your information when you visit this website: deactivate Google Analytics. pursuant to Article 77 GDPR lodge a complaint with a supervisory authority. As a rule, you can apply to the supervisory authority in your habitual place or residence, place or work or our headquarters. If your personal data is processed on the basis of legitimate interests pursuant to Article 6(1), sentence 1f, you have the right pursuant to Article 21 GDPR to object to the processing of your personal data if there are reasons arising from your particular situation or the objection is against direct marketing. In the latter case you have a general right to object which we shall implement without the statement of a particular situation. If you would like to avail yourself of your right of cancellation or objection, it is sufficient to send an e-mail to k.goergen@fz-juelich.de. When you visit our website, we employ the widely used Secure Socket Layer (SSL) procedure in conjunction with the highest level of encryption which your browser supports. This is usually a 256 Bit encryption. If your browser does not support 256 Bit encryption, we revert instead to 128 Bit v3 technology. You can see from the closed symbol in the lower status bar of your browser whether an individual page of our website is being downloaded in encrypted form. We use appropriate technical and organisational security measures to protect your data against accidental or deliberate manipulation, partial or complete loss, destruction or unauthorised access by third parties. Our security measures are continuously improved in line with technological developments. Amendments or adjustments to our data protection declaration will be necessary from time to time for legal and/or organisational reasons. Please note the latest version of our data protection declaration.